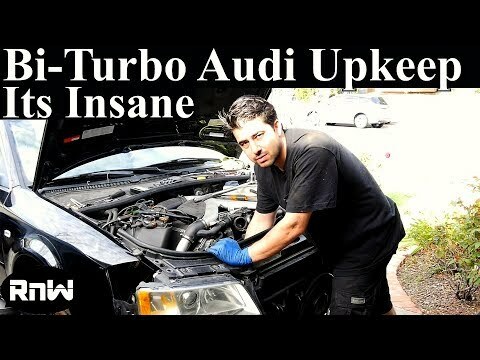 In this video I will show you the cost and labor involved in maintaining a Bi-Turbo Audi. I will guide you through the procedures involved in replacing the camshaft seals, camshaft plugs, camshaft chain tensioner gasket, half moon seal and the valve cover gaskets. I think if you are thinking of buying an Audi you should watch this video. Is there hoes clamps on the other piping u put on before the y pipe? Greatly detailed videos. Thank you man. Hello I have a 2005 AUDI Allroad 2.7 bi-turbo – alternator is not working – no output voltage – can it be replaced without doing the front end service position removal of front end? Can I get to the passenger side cam chain & tensioner (even reple the tensioner) without removing the timing belt / cover and items in the front? just found your videos, good stuff man! Your long videos work well because of your tempo. FYI: The driver's side intake cam seal on the rear is a different part than the front seals. The cam rotates in the rear seal counterclockwise, whereas it's clockwise on the front seals. All of the new VW Audi cam seals are PFTE without a spring under the lip and are supposed to be installed DRY. Don't install the valve covers until AFTER you get the new timing belt installed. Then rotate the engine by hand at least two rotations, then reinstall the cam locking bar, check and recheck the timing on the cam marks. Count the chain link pins. If after that you're sure the timing is right, you can then install the valve covers. The timing chain tensioner plastic shoes should have been replaced when the tensioners were out. These wear out, get brittle and break off, leaving plastic bits in the head and down in the oil pan, cause metal to metal sliding contact between the timing chain and tensioner, cause extra slack in the chain, and then the chain can then jump a tooth or two and cause the valves to collide with the piston tops. Yes I am speaking from experience. Happy wrenching. great video thank you for your time & effort. thanks, detail is helpful, doing a repair of A6 with cam belt failure. I keep hearing these "myths" that you can replace the camshaft chain tensioner gaskets on the driver side without taking the timing belt off, the more I see this, the more I wonder how much those people have suffered just to do that, if they did. Since you've done this at least twice now from your videos, do you think that's also an impossibility? OMG you are so skilled and thorough!